bring any misc stuff to make wax prints with or tools or anything else you can think of! 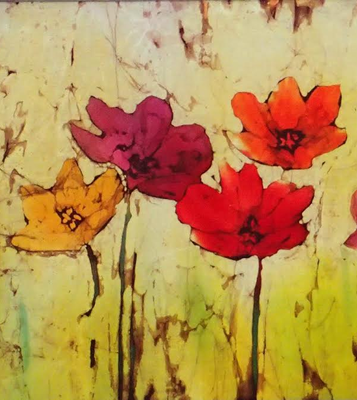 Come make colorful, intriguing pieces of art by applying hot wax and colorful dyes to cloth. Whatever your experience level, we invite you to join us for a day or a weekend of creativity! Experienced batik artists will be on-hand to lead you through the process, help you with ideas and answer questions as they arise. The wax is applied to fabric and resists the dyes, allowing the artist to create patterns or images. Start with a piece of white cloth and build up an image with layers of colors by adding wax, dipping the fabric in dye, removing the wax and repeating the process for each color desired. This ancient art form began as early as the 4th Century BCE (before the common era) in Egypt, yet remains a vibrant, beguiling art form. Even if you’ve never tried your hand at batik or think you haven't a creative bone in your body, you are welcome to come and get started experimenting alongside other artists, with supplies and workspace provided. You will get the help you need to get started, plus you can ask questions whenever you need guidance! You can expect to finish 4 to 10 pieces of art to frame. Dyes, wax, tools and fabric will be supplied. Just bring yourself and your ideas! And, if you don't have an idea? We have those, too! Price is $75 + $20 supplies for one day, $110 + $25 for both.